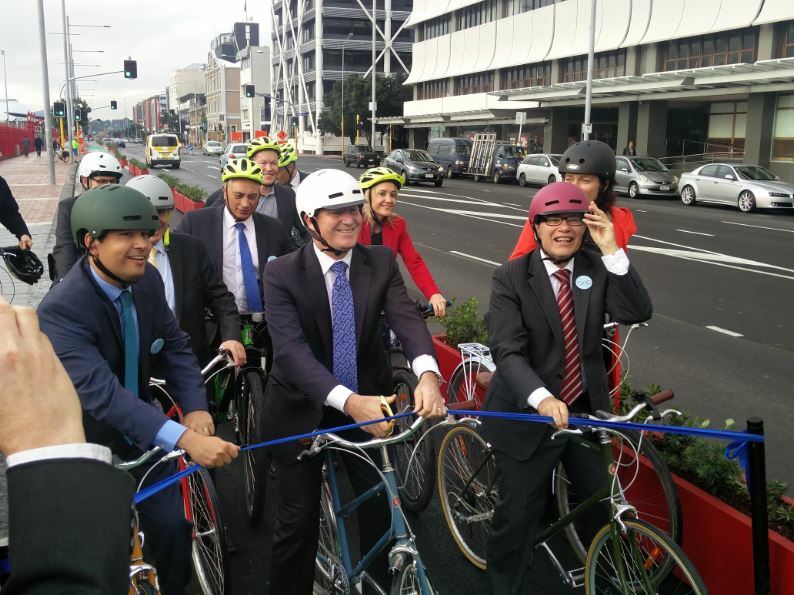 On Saturday, one of Auckland’s most important cycleways turned one. The Quay St cycleway was opened on July 08, 2016 by now former Prime Minister John Key. One of the best things about the Quay St cycleway is that it’s on-street and is a great example of how we can get more efficiency out of our road network. After all, no traffic lanes were harmed in the making of this cycleway. Auckland Transport now have over 30 automated bike counters around Auckland with most focusing on the cycleways in and around the city centre (to measure help measure the impact of Urban Cycleway Programme). The Quay St cycleway is unique in that it’s the only one in Auckland (and one of only two in the country) that has a public display. You can also see the results daily here, along with those of 164 other counters. After opening the numbers riding on Quay St quickly racked up. The counter reached 50k in less than 3 months then only two months later it reached 100k. Now a year on and the counter has recorded just over 281k trips, averaging about 770 per day. The actual number using the cycleway is likely much higher as many use some parts of it but exit before reaching the counter which is west of the Albert St intersection. The graph below shows the daily usage over its first year. 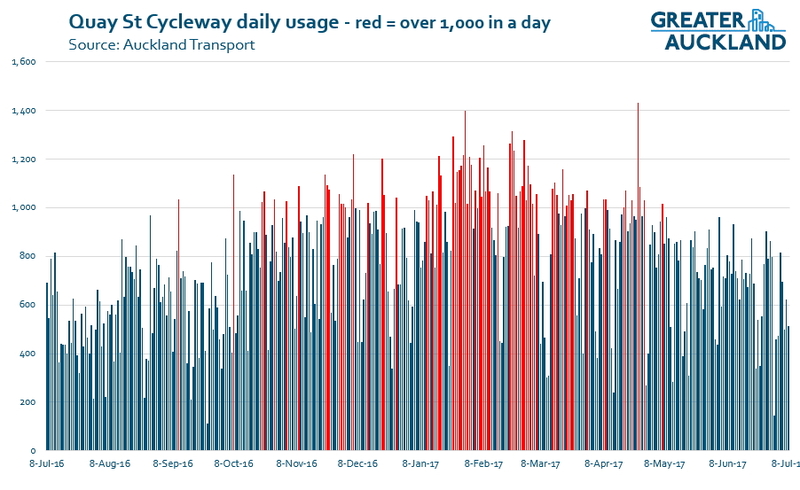 The red bars show the days with over 1,000 trips recorded and make up about 20% of the days. As you’d expect, the busiest periods were over the summer months. 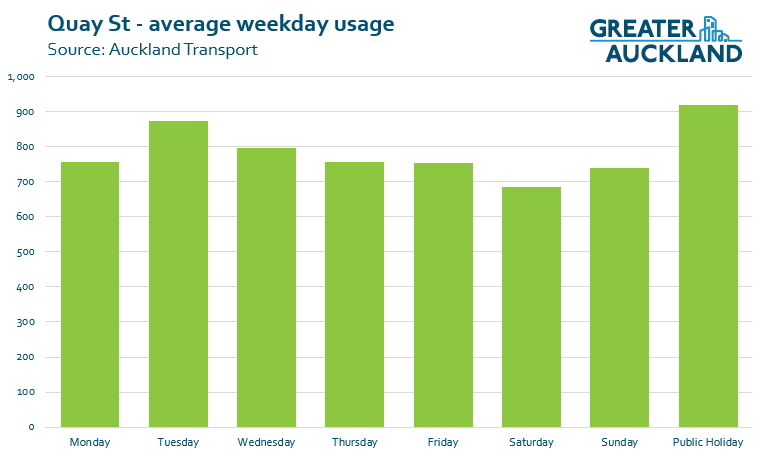 To put that usage in perspective, more people have used the Quay St Cycleway in the last year than used the popular NW Cycleway at Kingsland – which saw 256k trips in the year to the end of June. The result makes it the third busiest counter in Auckland behind Tamaki Dr (439k) and further east on Quay St by Spark Arena (388k). With the exception of public holidays, the busiest day of the week tends to be Tuesdays with an average of 873 people recorded on those days. We also learnt recently that the addition on of the cycleway on Quay St resulted in significantly fewer people on bikes mixing with those on foot. 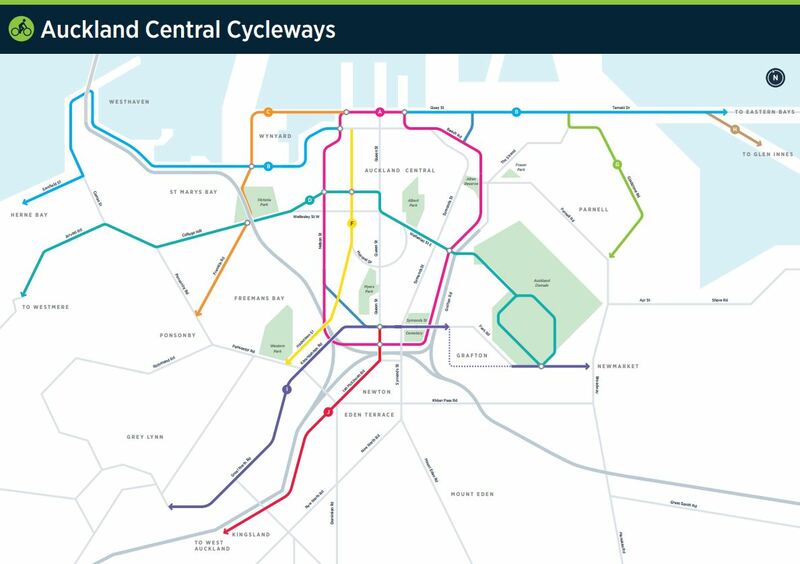 The cycleway is only going to grow in popularity, both from more and more Aucklanders getting on bikes and especially so after further connections are made. On the western side, the extension of the Nelson St cycleway from Victoria St to the waterfront is already under construction while on the eastern side it is being extended another ~800m to the intersection with The Strand. That will be hooked into improvements on Tamaki Dr and the cycleway that connects to Glen Innes. Happy Birthday Quay St cycleway. I use it daily (although rarely go past the counter). It has had the biggest impact on my evening commute, making it really easy to get back to the ferry. Mixing with the traffic, or crossing over to the shared path and squeezing through the only Explorer bus stop was never fun. When the Neslon St. route is complete I might go the other way to mix it up a bit, Grafton Gully or Light Path, since I still have about 1/2 Km to go after Upper Queen St.
One of the best details about the Quay St. route is the way the road drains were brought up to street level so that they can be ridden over at speed with fearing an OTB moment (Over The Bars). This should be the standard for all roads as AT resurfaces them, whether they host a cycle lane or not. One of the best things done in the last few years and definitely the best for cycling. It has made heading west in the city so easy. Once we have a clear connection on to Nelson Street, it will only get better. It would be great to have a public counter on Nelson Street to counter (boom!) the claims that it is not used. Of course, it is used a lot. It is just that in Auckland unless the vehicles are bumper to bumper like car traffic, it is not being used. The funny thing is that as a pedestrian I can clearly see vehicle traffic is not bumper-to-bumper there are big gaps in between the different ‘slugs’ of cars. The problem is as a driver you are almost always in one of these ‘slugs’ so it feels like the roads are continuously jammed. +2. In my walk home I jaywalk across Parnell Rd, The Strand and Beach Rd… easy to navigate through the big gaps between “slugs” of cars. the best thing AT has ever done for my health. I started biking to work everyday since it’s open and I have seen great health benefits. Let me make it clear that I like this bike lane (not that I’ve used it yet). However if a good day is about 1000 users and assuming say 12 daylight hours when the bikes are used that still is only one bike a minute. How does that compare to cars? Buses? So is it significant or just a feel good? Graphic complaint – swap the male and female for riding on the pavements; pardon this sexist remark but women tend to keep rules and men tend to break them. Just been checking other countries and 1000 isn’t too bad . Once other connections are built, I’m expecting much bigger numbers. Bob – I don’t know the numbers for cars, but it is worth remembering that this takes up a fraction of the road space of the vehicle lanes. There would have to be a significantly higher number in cars for for the volume of road space to users to be even. Safe cycle ways increase overall ridership, and they increase the proportion of cyclists who are female. On average, women are more safety conscious or risk averse than men. The safety of a cycle network can be measured (somewhat) by the proportion of users who are female. There may be times when women follow the rules more than men; I don’t know. When the rules aren’t designed with safety in mind, they don’t. You must be right. Safety is a prime requirement. I’m a terrible hangover from the days when everyone cycled so I chance my arm and go wherever I like only keeping an eye out for the police. I wouldn’t bike like that if I did it everyday and especially if I had a family depending on my safety. Nor do I recommend it for others. In the good old days cyclists cycled facing the traffic – it was much safer that way especially on narrow country lanes. Provided costs are kept under control this is the sort of infrastructure improvement that everyone can agree on. Nothing is sacrificed and what we end up with is a great example of how different transport modes literally work side by side. It is concerning that 33% of cyclists are still using the road. Perhaps we need an education campaign to get cyclists to use cycleways? Surely not! Though the numbers using the cycleway are very disappointing there is little opportunity cost. This should be the blueprint for future development. Not to steal existing roading/footpaths from existing users but to add to what is already there. I often cycle on the road (westbound) because getting to the cycle lane is awkward. Once connected properly to the cycle “network” at both ends I will use it all the time. The high usage of this path is impressive for such an isolated piece of infrastructure. I love the Quay St cycleway, but I find that AT statistic odd: 33% of the 1,000 users still cycle on the road, so 330 cyclists each day cycle on the road (unless the cycle counter only counts users in the cycleway, in which case the 33% is in excess of the 1,000, so, 500 cyclists on the road). 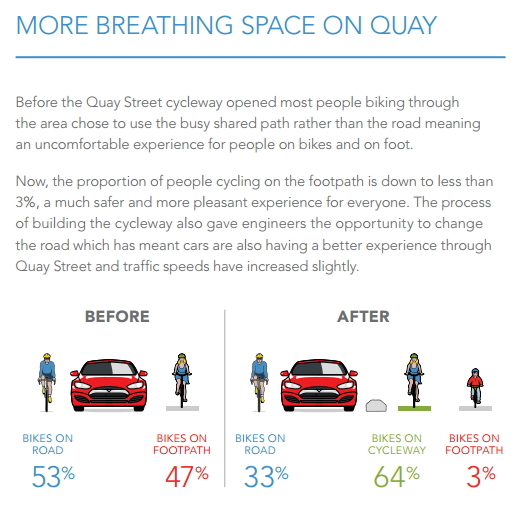 Either way, compare that to the 53% of Quay St cyclists that cycled on the road before the cycleway. I understand there were around 500 daily cyclists on Quay St prior to the cycleway. So 53% of 500 is around 250 daily cyclists using the traffic lanes. And so to my point: Has the Quay St cycleway actually INCREASED the number of cyclists on the road??? The only reason I can think of other than strange data is using Andrew’s comment. Maybe lots of people have been encouraged to cycle because of the cycleway, and on the eastward journey, they are counted. On the westward journey, they make a day-to-day decision about whether traffic is so bad they need to get to the cycleway, or just use the road. So road user numbers have gone up because the cycleway is there and they have the choice of it but often feel safe enough on the road. Any other ideas? With regard to cyclists on the road, Andrew makes a good point. It’s this type of post implementation review that needs to occur to try and understand how to drive use of the infrastructure (I’m sure they checked all this before spending money, however there’s always lessons to be learnt with any project). Making it more attractive for cyclists to use the infrastructure is important beyond the obvious “if it’s effective I’ll use it” argument – When driving, many people turn into possessive monsters. It’s well known that many motorists are anti-cyclist and, by extension, probably not fans of cycle infrastructure spending (especially since your average person thinks that the solution to congestion is to create more lanes. How dare the cyclists steal _their_ land). The more cyclists using the infrastructure, the more drivers will notice and add their support to the infrastructure as it’s less cyclists on _their_ road. Yes. I hope the good people in the AT cycling and walking team are able to do a proper audit afterwards, highlighting features and approaches that work and that don’t work so well. I imagine they are. “Though the numbers using the cycleway are very disappointing” – Maybe from your POV but everyone else is thrilled. It far exceeds any estimates or projections and it has been a massive success. When you consider that it is not really hooked up to an entire network, it is even more impressive and shows the latent demand for cycling in Auckland. It is the network equivalent of SH20 before the Waterview tunnel with no clear entry/exit. Who’s responsible for the upkeep of the planter boxes seperating the cycle way from the traffic on Quay Street? The early summer and lack of rain has made the boxes look like an urban desert with tumble weed. Is it AT or the parks that need to get a mobile water bouser and pump some green back into the brown dried plants?